This is a painting by Francisco Goya. 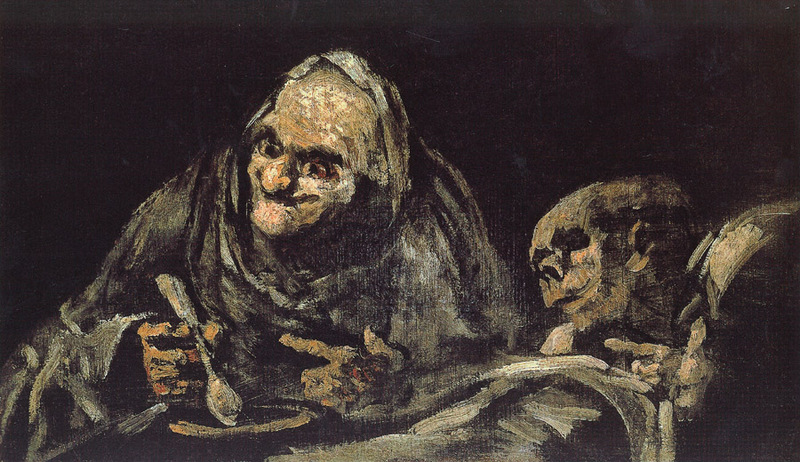 It’s called “Two Old Men Eating Soup.” It’s one of Goya’s “Black Paintings” which is a series of paintings Goya painted between 1819 and 1823 while he lived at Quinta del Sordo (The House of the Deaf Man). It was originally painted on an interior wall of the house. It’s a very unsettling painting but doesn’t it kind of remind you of Frollo and Quasimodo. Like Frollo is teaching Quasimodo about soup. I doubt that this painting and novel have any connection to each other, it’s just that figure on the right looks like it could be a dead-ringer for Quasimodo and with a second old man that means Frollo. It’s a creepy painting isn’t it?